Davis, Martin 2017. Philosophical Explorations of the Legacy of Alan Turing. Vol. 324, Issue. , p. 153. Pereira, L. M. 2012. Turing is among us. Journal of Logic and Computation, Vol. 22, Issue. 6, p. 1257.
van den Hauwe, Ludwig M.P. 2011. Hayek, Gödel, and the case for methodological dualism. Journal of Economic Methodology, Vol. 18, Issue. 4, p. 387. 2011. The Universal Computer. p. 177. Spackman, Matthew P. 2004. Can Machines Adequately Simulate Human Emotion?. Theory & Psychology, Vol. 14, Issue. 6, p. 755. FUJITA, Shingo 2003. Use and Misuse of G^|^ouml;del's Theorem. Annals of the Japan Association for Philosophy of Science, Vol. 12, Issue. 1, p. 1. Bringsjord, Selmer and Xiao, Hong 2000. 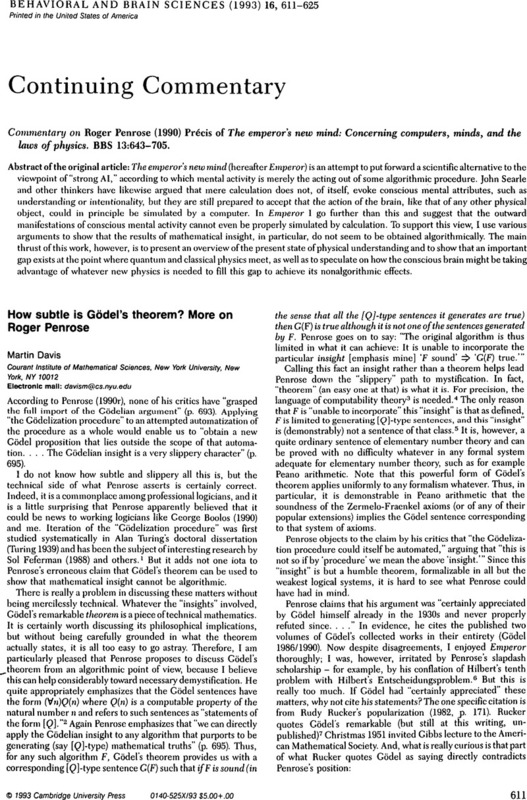 A refutation of Penrose's Gödelian case against artificial intelligence. Journal of Experimental & Theoretical Artificial Intelligence, Vol. 12, Issue. 3, p. 307.